Outdoor Adventure Australia — Who are we? Outdoor Adventure Australia is an adventure provider based on the Sunshine Coast, Queensland, Australia. Outdoor Adventure Australia is a growing business and acts as an umbrella company for businesses that we are acquiring along the way. These include Hike Australia (our hiking company) and Grab Rock (our abseiling and rock climbing company). As adults who were lucky enough to participate in adventure activities throughout school and young adult life, we were left wondering why no one was providing challenging adventures for adults!? So we did something about it. We have become a lead provider of some of the most diverse and challenging activities in Australia and we are certainly not done building yet. Created by people with a lifelong passion for having fun in the Australian outdoors and a desire to share this passion with everyone they meet. The faces that you will see leading your activities are the tip of the iceberg when considering what goes on behind the scenes. Realistically, Outdoor Adventure Australia is the result of a community of absolutely incredible people who I could never thank enough for what they do. An incredible bunch of legends who I am privileged to have in my life. What a team! As the Director, I’ve been so privileged to work, train and play alongside this amazing bunch of individuals. Nearly every day my team inspire me with their positivity, vision and support for each other and our clients. I cannot overstate how much appreciation I have for my team and the joy that they bring to running the business. I’m frequently ROFL at some of the comments and observations that they make and I love the value that this provides to our clients, to the business and to my life. Kris is an avid outdoor enthusiast. As an only child growing up in the bush and then in a small surfing town, it was only natural that an adventurous outdoors lifestyle was par for the course. Most days while growing up were filled with some kind of walk or ride through the bush surrounded by kangaroos, snakes and spiders. His passion for flora and fauna was only rivaled by his passion for community health and welfare. This lead to University study in science, public health and psychology, resulting in a degree in Science with a major in Public Health. Obviously hobbies and interests are vast but hiking, abseiling, snorkeling, mountain bike riding, camping, kayaking, skateboarding and fishing are probably the most common. Kris also holds a Certificate IV in Outdoor Recreation, black belts in a number of martial arts and spent a number of years as a Queensland Scout and Venturer leader. 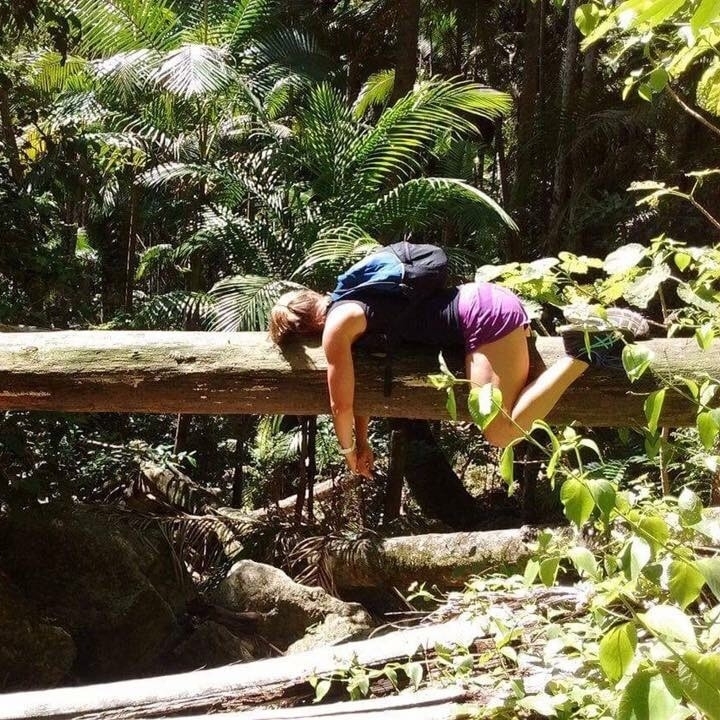 Outdoor Adventure Australia has stolen Pru away from Restless Explorers where Pru spent a number of years taking people on single day or night hikes throughout the Sunshine Coast. What a legend. You know those people who make experiences really enjoyable but you also instinctivly know will perform under pressure? The ones that you trust a little more than others because you’re confident that when it starts to go bad, you’ve got someone to rely on? That’s Chontelle. The epitomy of chillaxed, an avid adventurer and all round nice guy who loves to climb. One of his super powers is that he always knows how to defuse any tense situation with his timely injection of unique humor. Allanah’s calm and capable nature accompanied by her vibrant persona is an absolute asset to our organisation and I’m confident that our guests are always going to enjoy their tour when Allanah’s in control!